The Syrian civil war has created over 3 million refugees, over half of whom are children. These are ordinary people fleeing death and destruction who have left Syria for the surrounding countries of Lebanon, Iraq, Jordan and Turkey. While this is the largest refugee crisis in a generation, the world has yet to provide sufficient support. Many Syrians, mostly children, still need the basics: shelter, education, food, and security. The UN Refugee Agency currently reports it is 49 percent underfunded after three years of war. If journalism is supposed to make things better, then the reporting on the Syrian war isn’t working well enough. Help is not on its way: The money to pay for refugee services is not forthcoming. When I decided to try to report on the Syrian crisis, I knew that many fine photographers were already covering the story from many angles. I felt it was too dangerous for me to go into Syria to cover the fighting. While we were in Turkey, two colleagues were kidnapped just across the border. And I wasn’t convinced I’d be able to show anything new and compelling. However, the refugee crisis was easy to photograph, and I felt reporting on their situation might do some good. I wanted to try something different, an approach that might shift the public from sympathy to empathy. To make this financially feasible, I had to design a project that could draw funding while standing out from the existing coverage. I decided to follow through on an idea I’d had while covering the tsunami in Thailand: combine portraits of children with their drawings. I figured that everyone responds to pictures of children, and drawings of war are less disturbing than pictures of the real thing. I was also mindful of the fact that while I had won a World Press Photo award for my photographs of the mass graves of Kosovo, I never sold a single picture. At the time, too many editors told me their readers did not wanted to see graphic images of depressing subjects, and I didn’t want to repeat that failure. To raise money, my partner (the photographer Mieke Strand) and I decided to use the crowdfunding site Kickstarter.com. The process turned out to be long and stressful, but ultimately successful. We chose Kickstarter because we believed the site would solve the problem of being discovered. We hoped the funding platform would promote the project and that the public would take us seriously because we were on Kickstarter. It didn’t work out that way. In the end, almost all our support came from friends, colleagues and family. Kickstarter never mentioned us as “Featured” or “New & Noteworthy.” The only way to find our project on the site was to know about it and search for it. We tried to get mentions in blogs and media sites such as The Huffington Post, but with no photos to show and only the idea for a project, no one was interested. Instead, we posted on Facebook, tweeted on Twitter, and wrote emails to everyone we knew. Over and over again. I used to believe that all truly worthy projects would attract the money to support them, either from patrons or the public. It just isn't true. In the end, I’ve made my peace with reality, and I now contribute to other people’s crowd-funded projects. It’s like being part of a big, informal cooperative in which we support each other. Today, I support you — tomorrow, you support me. So it was, after 25 stressful days of emails, Facebook posts and messages, tweets, and telephone calls, we met our funding goal of $7,000. Setting up the project also presented challenges. I expected to find and follow UNICEF or Médecins Sans Frontières (MSF) teams working in the refugee camps. However, Turkey tightly controls foreign aid organizations. Much to our frustration, we eventually realized that we weren't going to get into the refugee camps and we weren't going to work with an aid organization. We did have a backup plan, however. In California, we'd contacted a fantastic group of art therapists in Istanbul who offered to hold sessions for refugee children. Our initial meetings went well, but the increasing climate of fear in Turkey led them to back down. Following the huge demonstrations across the country, the Turkish government was arresting even the doctors who had helped demonstrators and the therapists were afraid of attracting any attention. We were on our own. It was time to stop planning and to go where the action was. After wasting a month in Istanbul, we left for the border region of Hatay, and an old friend of mine immediately put us in contact with a school that held art classes. The school invited us in with open arms. Next, a French NGO found us on the Internet, and their local representative connected us to two more schools. 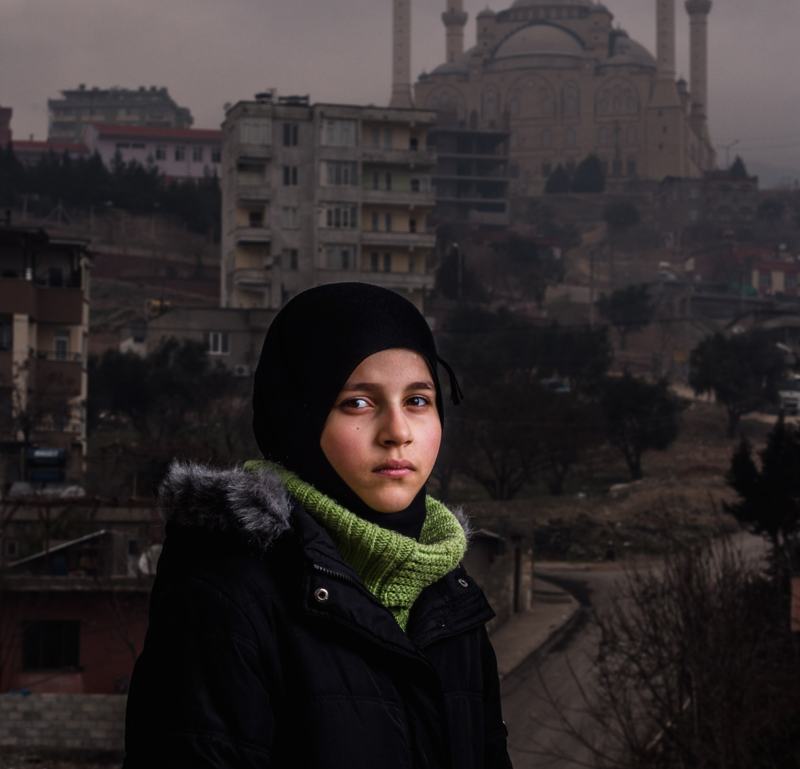 We found the fourth school through a reporter we met in Istanbul. Over eight working weeks, we spent time in four Syrian schools (and a neighborhood tea garden), where we photographed hundreds of portraits of Syrian children and collected drawings from art classes and improvised art therapy sessions we provided on our own. At the first school, we had art classes, taught by a teacher or myself. At the last three schools, we were joined by Ezgi Içöz, an American-trained expressive art therapist from Istanbul. The schools were very happy to get free art therapy, art classes and art materials, and they selected students and gave us space to work in. The children were wonderful to work with, too, and they enjoyed posing for the camera. The children drew horrible scenes of war. Trying to please us, the teachers encouraged them to depict violence and propaganda, but after the first two classes, I insisted on positive themes. It was a case of choosing the students’ well-being over what I knew an editor might want. As a journalist, I'm usually an observer. For this project, I was also a participant, and it was wonderful. Twice I had the opportunity to teach the kids. Watching those lessons come alive was a true joy. After seeing the horrible drawings they so easily conjured, it felt great to give the children a chance to think outside the war zone and to have some fun. Instead of searching for war’s misery as a journalist, I got to look for the good as a teacher, and I was rewarded, over and over. Getting explicit consent to photograph the children and use their artwork was far more difficult. The refugees were very suspicious of anything that smacked of officialdom. Only after the project was finished was I able to get emails expressing consent. When we returned to California, I figured that I had pictures the media would want. I had beautiful images of beautiful children and strong, emotional drawings to go with them. I ran intro trouble immediately. Of the 30 or so editors I emailed — many of whom I had previously worked with — only four replied. The editor of the prestigious German newsweekly, Stern, explained that they’d run a series of photos of Syrian children by an AP photographer. Three others said they already had Syria projects in the works and weren’t interested. The rest didn’t respond. Moreover, it is standard practice to “embargo” or withhold the photos from the Internet prior to publication. That meant I couldn’t publicize the project while it was new. Most media outlets I know refuse to buy photographs freely available online (including on a personal website). If I had established prior interest, and if I had maintained ongoing relationships with editors, I might have had more success. I did get one break. Through a friend, I got a connection to National Geographic Proof, and they ran a blog entry (and paid a modest fee for use of the photos). Another website offered an unpaid blog post, but I decided against it. Finally, after six months of trying to reach editors, I finally gave the material to my photo agency. I immediately got a small sale with Paris Match online, and a small German magazine. Even after 15 years of photojournalism, I was surprised at how difficult it was to publish a unique, educational, beautiful photo essay. More recently, my pictures were shown at two small exhibitions — one at a local bagel shop, the other at a conference about the Syrian refugee crisis inside the foreign ministry in Berlin, Germany. The bagel shop show sparked daily discussions in a heavily trafficked spot, and the German foreign ministry show reached visiting heads of state. The pictures will continue to be used in small diplomatic exhibitions and in a state publication. The artwork has also led to a collaborative project with Jesuit Refugee Service, in which artwork is exchanged between refugee children and children in other countries. I have my own software for publishing iPad book apps, and so I was able to design, write, and publish an app showcasing the photos in about four months, most of which was spent writing and researching details from the trip. The idea behind the app was to have a media channel of my own, and to be assured of publication and distribution. And, given the problems getting the material in the media, that much of the plan worked. However, getting people to learn about app has been difficult. Most downloads (about 60) happened after in the days after I published it and alerted our funders about it. The National Geographic Proof post sent around 45 people to my website, and led to at most five app downloads. (I used a website called App Annie to track downloads.) Of 98 total downloads, only 30 percent are from the United States. This means even our project backers didn’t bother to get the app. Frankly, reaching only 98 people is pitiful. This is a story about lessons learned, but if this project sounds like a failure, I should correct that impression. First, the project was fully funded, aside from living expenses at home. Much of my career has been working on speculation, and this was a breath of fresh air. Second, I now have a long-form, multimedia project to show to potential funders and clients, and at the least, it has opened some doors for the future. Third, almost year later, opportunities are appearing as people discover the work. The work might seem old to me, but for everyone else, it is new and relevant. A major online magazine wants to run an article, I have an interview scheduled with a Syrian radio station, and the German foreign ministry will include pictures in an exhibition for visiting heads of state. Fourth, ideas breed ideas. I'm collaborating with a friend who’s a former journalist to start Any Refugee, a project to send postcards to refugees. The Inside-Outside Project concept includes the idea of sending drawings back and forth, both to create new material and to engage my audience. The Any Refugee idea encourages painted postcards, so I'll be adding those to my project. Raise your own money. When it comes to photography at least, you cannot depend on the media to buy anything, and the reasons may have little do with the quality or importance of your work. Unless you have established connections with editors, don’t assume you’ll be able to reach anyone at all. While mobile apps can aid in publication and distribution of your work, you still need to publicize the app to get attention. Work takes time to be seen and accepted. By definition, journalism is time-sensitive, but for long-form work the time frame isn't weeks or months — it can be years. As journalists, we want our work to be the next big hit, to go viral across the Internet, but obviously that doesn’t always happen. Sometimes the rewards are less obvious. And yet, despite the setbacks and difficulties I experienced, I still believe that with time and effort, good material will find its audience.